The Beatles taped this ad-libbed song during a recording session for the White Album, following an impromptu version of Paul McCartney's Step Inside Love, which he had written for Cilla Black in 1967. Although Los Paranoias is credited to all four members of The Beatles, George Harrison did not attend the session or otherwise contribute. It was recorded on 16 September 1968, during a session for I Will. In between takes, McCartney led the group through a bossa-nova version of Step Inside Love. The song had been the theme tune to Cilla Black's BBC TV show, which began in January that year. After the song, McCartney can be heard mockingly announced the fictional group 'Joe Prairies and the Prairie Wallflowers'. Lennon follows up the comment by saying 'Los Paranoias', perhaps in reference to Trio Los Paraguyas, who often appeared on BBC television shows in the 1950s and 60s. With Lennon and Starr on percussion, McCartney then improvised Los Paranoias. The song lasted 3'48, but was faded out to last less than one minute when it appeared on Anthology 3. The phrase 'Los Paranoias' was a running joke within The Beatles, and was nearly used in the lyrics of Sun King on the following year's Abbey Road. Lennon eventually used the phrase on his 1973 solo album Mind Games. In the credits for the Plastic U.F.Ono Band the clavinet was credited to "Dr Winston O'Boogie & Los Paranoias". O'Boogie was a pseudonym adopted by Lennon in the mid-1970s. John says Los Paranoias because that was the beatles themselves referred to themselves as, as an inside joke between the guys. Is the full version available anywhere? Yes! there’s a full version. On the same subject, is there a full demo version of “Step Inside Love” with Paul on vocal instead of Cilla Black? If so, where…? According to the article, John played bongos not wood blocks. I’m not sure about that – I can’t hear bongos on the recording. The line-up came from Ian Macdonald’s Revolution In The Head, but I think he was mistaken. I’ve changed Lennon’s contribution to ‘percussion’, hedging my bets. I dunno how anyone’s hearing wood blocks or bongos. They’re coconut halves overturned and played against a table like one would do to make horse galloping sound effects and whatnot. You can hear the hollowness. I think that level of percussion skill was Ringo, not John. Ringo for instance, could hold a stick on one hand and shaker or maracas on the other. John was more likely on the bongo as it was simpler to play. The percussion instrument that sounds like coconuts are actually “claves” that consist of a pair of hollow wooden sticks and Ringo is credited with them on Wikipedia. Is there some online nook where the full version can be obtained? you can get the full version of this song on the L P revolution…..take your knickers off. 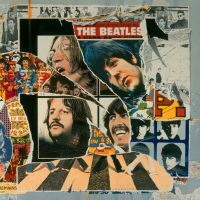 It`s on vinyl,and c d .
The Beatles never referred to themselves as Los Paranoias… It is clearly a joke by John commenting on the laughable latin tinge of Step Inside Love. Paul got the joke and the rest is history… And yes, Bongos are clearly heard on the full version… Let your face grow long and youtube Los Paranoias. I’ve added some information on the use of the phrase elsewhere by The Beatles. I hope that helps clear things up a little. I feel like it was an inside joke or something. John says “Los Paranois” and then Paul starts laughing before launching into the song. Gotta mean something to them that none of us get. The hollow wooden things getting a battering are actually called Temple Blocks. You know them, Chinese looking things so beloved of old jazz drummers. Unreleased Songs from “I Will” Sessions. Txs to Joe for a great site, as I totally forgot about these tunes, and his daily updates brought me back to give it another listen. It’s a good thing that the 50th Anniversary edition of the White Album came out. We get the complete recordings of Step Inside Love/Los Paranoias in all of their glory (and silliness).